If you’re infantry, there are fairly good odds you will exit the Marine Corps with worse hearing than you had. If for nothing else, then the fact that you will fire weapons basically all the time and will wear hearing protection for very little of it. This isn’t usually a conscious choice–though sometimes it is–but more often than not you simply don’t bother to put hearing protection in when you’re firing because it’s a hassle and we’re all very lazy creatures. That weird tone test at the end of your enlistment becomes the most difficult test you’ve ever taken in your life. Trying to distinguish the 1980’s style digital tones from the backdrop of your constant tinnitus ringing becomes a nerve-wracking endeavor. Did I just hear a tone…? CAN THEY TELL I DON’T KNOW?! Press that little button if you dare. On a side note, this strip was created with the help of the veterans of Spokane, Washington at Gonzaga University earlier this week. I was invited out to Gonzaga as part of their Telling War series, which is a great program inviting guest speakers of veteran artists such as myself to talk nonsense and hang out for a couple of days. 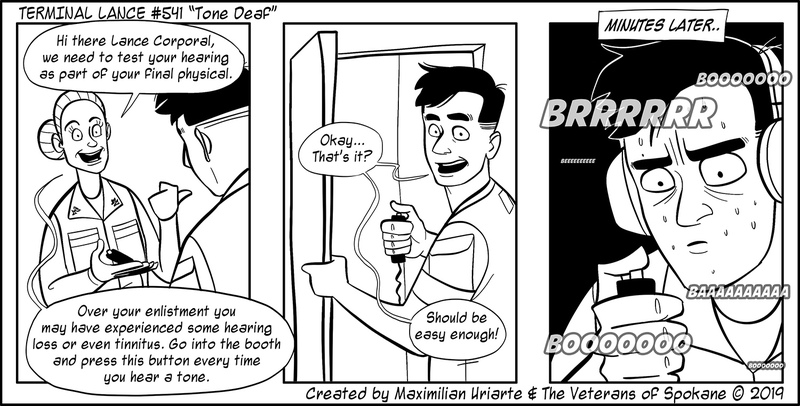 This strip was created during a workshop that I led with a small group of veterans on the campus, and every single one of us knew exactly how this awkward hearing test goes. While I was there I also sat down with KPBX, the local public radio affiliate and had a great conversation that you can listen to here. I also sat down with a super cool couple of veterans running a podcast out of Gonzaga University about veteran success stories that you can listen to here. Massive thank you to everyone that came out to show the love and helped make this a great trip! Also huge thank you to the veteran group that helped me whip up this comic!